Jólabókaflóð has its roots in World War II, when wartime restrictions on imported goods severely limited Icelanders’ gift options for the Christmas season. Import restrictions and taxes were much lower on paper than most other items, making books an affordable holiday gift. As many of the restrictive laws stayed in place after the war, the book-giving habit stuck, becoming so popular that today the majority of books sold in Iceland are sold between September and December, in preparation for the giving season. For a nation with a population of just over 332,000 people, Iceland has what some might call an outsized literary appetite. (As if that was even possible!) 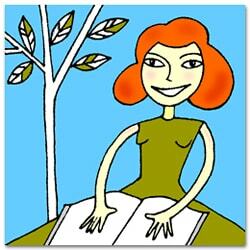 93% of Icelanders read more than one book a year, and 50% read more than eight books a year. By comparison, in 2015, only 72% of Americans had read a book…and they didn’t necessarily finish it. 10% of Icelanders will actually publish a book during their lifetime, and in 2009, book loans at Reykjavik City Library exceeded 1 million…in a city with 200,000 residents. In fact, Reykjavik is one of twenty-eight UNESCO Cities of Literature. The United States, with a population of more than 325 million, has only two: Iowa City, home to the prestigious Iowa Writers’ Workshop, and Seattle, home to the Book Discounter Who Must Not Be Named. Here’s the good news, American bluestockings: You don’t need to move to Iceland to revel in your own “Christmas book flood.” Jólabókaflóð is a tradition that’s easily replicated in your own seasonal celebration, and Bas Bleu is here to help! Festive giftwrap? Check and check! As Christmas traditions go, Iceland’s Jólabókaflóð is our new favorite! We’ll definitely be incorporating it into our own families’ Christmas Eve celebrations. If you decide to try it out—or if you’ve been practicing your own version for years—share your stories in the comments below…or check in with us after Christmas! Don’t want to miss another post from The Bluestocking Salon? Sign up to receive our posts via email! Just scroll down past the comments section and you’ll see a space where you can enter your email address to receive notifications of new posts. And remember: Bas Bleu Society members always receive free standard shipping, 15% off most books, gift-wrapping services at half price, and special offers via email! My author friends and I did jolabokaflod last year. I’m a big fan. Thanks for the reblog, Sharon! When my kids (and nieces and nephews) were little, they would pick up one of their (wrapped) gifts and say “This is a book so it must be from Aunt Elaine”. I still give them books (and now they even appreciate them). This year I get to give my new grandson a book for Christmas. Yay! The first Christmas after a new baby joins a family, my present to the new father is my favorite children’s books to read to his child. It is never too early to start reading to your child. Books are our baby gift of choice too, Bonnie. They’re never too young! I have given books as gifts for more than 60 years, and besides gifting, I buy 8 to 10 hard-cover books for my own reading enjoyment. I pray that my favorite independent bookstore survives!! You sound like a great gift-giver, Robert! Devoted readers like you are essential to the survival of independent bookstores, and independent bookstores are critical to our communities and the book industry as a whole. Bas Bleu may not technically be an indie brick-and-mortar, but we share their passion…and we are always thrilled to hear that our customers also support their local bookstores. We love visiting ours, too! I adopted this tradition for the little ones in my life. Not as little anymore, they still get books, fuzzy socks and coca with marshmallows for Christmas Eve. My favorite gifts as a child and now as a sometimes reluctant adult have always been books, especially the ones that take you away to a different world. Nothing better during the holidays than a cup of tea, Christmas cookies and a new Book by the light of the tree. Sounds heavenly, Andrea! Thanks for sharing your traditions with us.